When I saw this weeks London Drugs flyer with both Sunlight and Green Works on sale I knew I had to go there on Friday and pick some up. 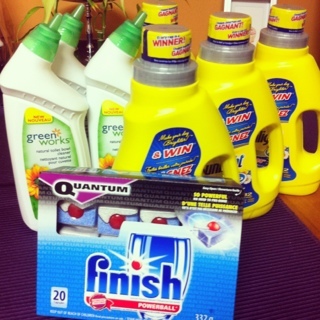 Okay, so I REALLY didn’t need laundry soap but I had some coupon stacks to use and I hoping to win more. Out of the 4 bottles I bought I won two FREE Sunlight laundry soap – and the other 2 (and the two I bought before) “won” $8.00 off Disney Lion King on blu ray – a little depressing that I won that 4 times – really Sunlight? The thing is, it is not really a win – Disney emailed me this coupon when it was released, the expiry date was not as long but still. I was hoping the finish would go on sale before the end of the month but with it being Christmas I don’t have time to keep paying attention and checking. I do have another stack to use but London Drugs only have on in stock so I will have to go back anyway. This entry was posted in canadian coupons, coupon stacking, coupons, london drugs and tagged canadian coupons, coupon stacking, coupons, london drugs on December 3, 2011 by Courtnie.